Technology capabilities provide new opportunities to improve the customer experience. Customer expectations are always changing, and these needs are being met with a wider range of channels and technology than ever before. Now, all of these interactions, touchpoints, events, and transactions are becoming part of a growing Customer Relationship Management (CRM) ecosystem that can enable all employees to better serve their customers. CRM is a technology platform that organizations of all sizes use to improve support during the customer experience. It stores customer and prospect contact information, accounts, leads, and sales opportunities in one central location for access by sales, marketing, service, and other departments. Though it’s been around nearly as long as the internet, it shows no signs of slowing down. According to Gartner, CRM software is expected to grow by 16 percent through 2018. And the CRM market will continue to expand as it becomes a mission critical component within many organizations. CRM has come a long way from being just a contact database where customer information is stored. 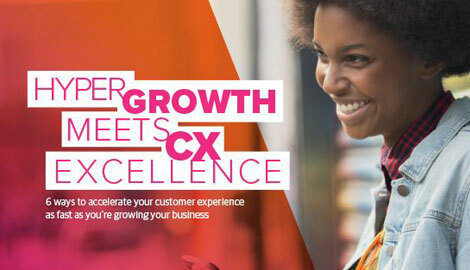 We have identified four trends that are helping organizations in their quest for better customer experience (CX), increased opportunity management, and reach with prospects and customers using CRM technology. Customer service: As AI chatbots are being deployed to handle more service requests, information is now being captured and leveraged through CRM systems. For instance, let’s say an auto insurance claim is initiated via a web chat. During its task handling, the chatbot collects necessary data—such as customer name—and authenticates the customer and vehicle. Upon collection, the data can be passed to a human associate to complete the insurance claim process. Bots are trained and can learn from feedback based on the success of the interaction. The feedback loop for a bot can lead to improvements after each interaction. Lead management: A sales teams can use AI to score a lead, increasing the likelihood of winning a closed sale. First, AI analyzes the lead and based on interest or buying history, it can provide a score and recommend what steps are needed to increase success. For example, a medical device manufacturer may receive a lead from a hospital. In this case, AI would use sales history, data about the hospital, close ratio of similar hospitals, and the interest level to provide a score. The AI can then recommend different products and features to offer, such as a field service contract for preventive maintenance, which would increase likelihood closing that individual account. Next best action: Using business rules and predictive models, AI embedded in CRM can recommend steps to sales or service associates to assist with service requests or upsell opportunities. As associates navigate through customer calls, AI analyzes the data they enter in the service request in CRM. Based on certain criteria, the system suggests an offer to sell, an add-on product, or service to the customer. The offers would not be generic but more in-line with the needs or circumstances of the individual customer. The idea here is that the associate does not need to remember to make an upsell offer. Task automation: Defining work tasks and if they should be performed either by a machine or human helps organizations enable their resources to better serve customers. Task automation also provides the step-by-step instructions of what actions to perform. During an associate’s interaction with a customer, the CRM system will direct or guide the associate as to what to say and do to inform the customer. Task automation is structured and prescriptive for what steps to perform based on input received, customer profile, or other business conditions. The tools to define task automation consist of diagramming like process tools or low-code tools that can be used by business-oriented resources. For example, an organization will have a business analyst define a task that describes how to process an insurance enrollment using a diagram tool that takes the analyst through each step, decision point, and predictive outcomes during the interaction. Work distribution: Task automation specifies process flow and tasks to perform and may identify that certain tasks need to be performed by other resources based on the skilled employees availability. The ability to distribute or route tasks is another capability within Process Automation trending in CRM platforms. Many Business Process Monitoring (BPM) solutions provide work distribution/routing while monitoring the performance of the work that are common in enterprisewide, highly complex integrated systems. And now CRM platforms are starting to provide BPM lite capabilities that are embedded into the architecture with abilities such as task routing, skill prioritization, resource availability, and monitoring of events. Firms can deliver many of the traditional BPM features within their CRM system. Third-party systems: The ability to plug in data from systems such as Google Maps, government subscription services, mobile cellular services, SMS text messages, and so forth are based on the internet and delivered through web services. The use of web services assumes that everything is a resource. Systems today—especially those in the cloud—provide communication protocols that enable access to data using web services. This level of collaboration enables an organization to communicate seamlessly with other sources and organizations, such as credit bureaus, to share customer information and expedite the service requests rather than making phone calls or sending emails. This level of integration will enable organizations of all sizes to increase their efficiency in servicing customers. IoT: Refrigerators, automobiles, medical devices, garage door openers, and many other machines are attaching themselves digitally to the internet. A report by Cisco predicts that by 2021 there may be nearly 27.1 billion connected networks and devices in the world. These IoT devices can send data about product issues, maintenance needs, improper usage, to an organization’s CRM platform. CRM vendors are beginning to provide platform connections to handle IoT feeds. Let’s say there are refrigeration units in a hospital that store vital medications. If there is a detection that coolant is low or something critical to maintaining the temperature, the refrigerator sends out a data message. The manufacturer of the refrigeration unit using an IoT platform would receive the message and relay it to the hospital’s CRM/IoT system. The CRM system would issue a case and workflow to notify hospital staff and assign tasks to move the medications to another refrigeration unit. Bitcoin and Etherium are leading cryptocurrencies that are experiencing many changes in valuation, but these cryptocurrencies depend on blockchain technology to serve as the public transaction ledger. Security: Blockchain assigns network keys that restrict unauthorized access, the security mechanism of blockchain. Since CRM platforms are in the cloud, cloud security has gotten better, but it’s still based on a centralized security system approach. Blockchain is decentralized and distributed through synchronization in a peer-to-peer networking approach. Fraud attempts are far more challenging to penetrate. This becomes a very compelling value proposition for CRM in which critical, private, and highly confidential information is required. Transparency: Blockchain is decentralized and requires no middleman to verify, such as a financial institution, or other third-party broker to provide. This increases speed to securely and transparently engage with customers. User control: Blockchain stores and encrypts personal data and verifies this access without sharing any specifics, thus controlling what level of data is accessed. CRM systems will, in effect, subscribe to customer data as permitted by each individual’s grant rights. Users will have the control, as opposed to current CRM systems that provide unlimited access to personal data without any user control. Clean data: Who is tired of how inaccurate your data is in other companies’ CRM databases? Duplicates, wrong addresses, wrong emails, and other elements create frustration for customers. Blockchain can store and encrypt personal data and confirm details upon inquiry (such as a mobile phone company verifying your address or current employer) without truly sharing data with the inquiring party. Instead of storing the customer submitted address, Blockchain would confirm the customers’ address complies with the mobile phone company need for a valid servicing address. Blockchain enables customers to have their own personal block that presents companies with a universally accurate profile of personal information, past transactions, education history, and credit reporting. This creates a more trusted data source for customers and the organizations that can access that data. Organizations using CRM capabilities that utilize trends, such as AI, Process automation, Data integration and Blockchain, have the potential to immensely improve their customer experiences. As these organizations continue to invest in their CRM platforms to advance their customer engagement, these four trends can play a vital role in where they should make such investments.